Discussion in 'General Discussion archive 2017 (read-only)' started by Cornflakes, Oct 2, 2017. Doesn't seem any different to the version we all know and love. Still has the slight tape hiss at the beginning. Quite perfect as it is, though. don't know, M should have edited that intro a little, don't need all of that guitar wankery. what?! how dare you?! that part should be looped and played for an hour before each of his concerts! And now it will be, in my head. Thanks for that. How dare you promote editing out Johnny Marr's brilliant guitar wankery but are enraged when even the tiniest cough of Moz, completely unrelevant to the song gets the same treatment? FLAC / Wav / WMA now in the download section for any without this track. Ah well - my dream of a rare soundcheck version disappeared. Compared to the released version, this doesn't seem to have been tampered with at all. A shame as it always sounded slightly muddier than the other live tracks they've released as part of this campaign. Just for my own amusement I have created a matrix mix of the audience recording and the soundboard version. I'll post the link in the downloads section. I've left in the longer crowd intro and outro and I find the addition of the audience recording lifts the higher frequencies and gives it a bit more air. my ongoing laptop problems,in mind, is this the one where Morrissey sings the 3 rd verse? 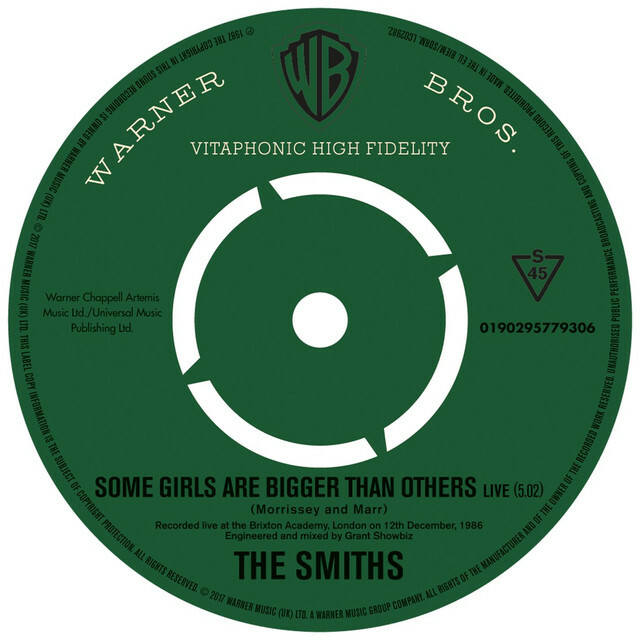 as sir Quando shortly mentioned, some guitarists you know without the song or performer [Brian Ferry-Right Stuff] it's 'THAT' guitarist, with this Smiths song Marr undoubtly puts his guitar riffs on this song. Thanks! You really go above and beyond for us. This track is so amazing live - Jonny's guitar is just stunning - Morrissey's playfulness on the vocals. Remember when Morrissey said he could hear "Starman" and forgive Bowie of anything? Well, I can almost say that about this ... let me give the new stuff another try. I think it's better than the studio version. I could listen to Johnny's guitar riff on a loop all day, and not get bored by it. I honestly think Morrissey could have sung any old gibberish over the top of this and it would still be a classic - it's just that damn good. Yes it is. And it was always going to be the track to be used in the Spotify campaign as it's the only time (per Goddard) they ever played the song. Having an extra verse is good, but IMHO the track (especially Marr's peerless picking) is ruined by Moz's whimsical singing in the choruses. I don't like the extra verse. And you? Well, it's a bit too obvious to my liking. None of the lyrics are exactly to write home about, for that matter. Waste of an excellent tune. Probably, but what am I supposed to have done now?